You don’t want anybody to tell you what to do. But sometimes you may secretly wish they would. Tell you what to do. How to fix something. We’re business owners. A lot like 3-year-0lds. We don’t want to be told what to do. We don’t want others to do it for us. We want to figure it out for ourselves. 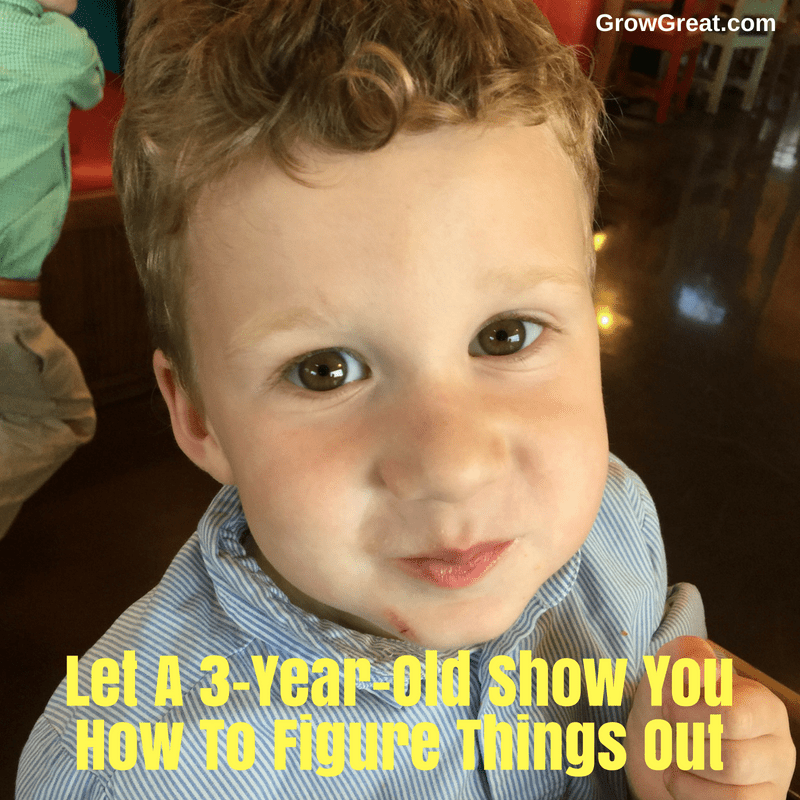 Like 3-year-olds we also are smart enough to know sometimes we need a little help. More than that, we need encouragement. Because we enjoy showing off. In all the best ways. Like Roy, we’re climbing. Finding the next handhold. Or foothold. Doing our best to not fall. Sometimes we’re gonna get a knot on our forehead. Or a scrape on our chin. It happens when you’re doing things you’ve not done before. Or when you’re doing things that you haven’t mastered quite yet. And when you’re pushing hard to achieve something that’s tough. We need that curiosity and bravery of a 3-year-old climber. We need the freedom and encouragement, too. Roy does better when he’s got an audience. It can just be his mom with her iPhone. An audience of one is enough when it’s the right one. But we’re not 3-year-olds. And as much as we may be able to learn from Roy, we’ve got far more experience and know-how. Questions abound. Our curiosity isn’t limited to physical feats like Roy. We wonder about things. We wonder how to address a challenge. Or how to deal with a problem to prevent it from getting bigger. We wonder how to fix things. And how to make something that’s good even better. Our days are driven by ambitions to get better as we grow our enterprise. We want more revenues and profits. And more sanity in our lives, too. That’s why we’re aiming to hit that trifecta of business building – getting new customers, serving existing customers better and not going crazy in the process. Roy sometimes needs a boost. It can come with words from those of us who love him. It can come with a helping hand to steady him. Sometimes we just show him so he can figure out how to do it for himself. Business owners aren’t 3-year-olds. We’re in our head a lot more than Roy. Which is why adults are required to keep him safe. He’s unaware of real dangers. Impulses drive him. We’re driven by data, information, and instincts. There’s quite a lot to think through. A lot to see. What may look like a good place to grab as we’re climbing may actually be a dangerous handhold. If only somebody could help us see what we don’t. Men and women. Roy needs all of us. His dad (my son). Me. His mom (my daughter-in-law). My wife. And there are others in his life. He’s got an older brother. They’ve both got an older sister. Males. Females. Those points of view matter. They serve Roy to learn a perspective he may not otherwise have. It’s insightful for him. Helpful. Roy has safe, trusted people who aren’t preoccupied with themselves at his expense. We’re all serving him to be his very best. As family, Roy had no choice. He’s stuck with us and we all love him very much. As business owners, we have to be more intentional about it. We have to work harder to put the right people around us. People we can trust. People who are safe. People with whom we can vulnerable. But also people who get what we’re going through. Like Roy we need men and women so we can gain as many insights from as many different viewpoints as possible. That helps us eliminate blind spots. It gives us the courage we sometimes need to pursue our questions. And our answers. Like Roy, it all works to help us figure it out for ourselves.